Forging pattern (kitae hada) : Kitae hada is clearly fine Itame wooden marks mixing with Mokume burl partially. Hiraji surface glows speckled whitish Ji-nie hard-metal granules that generates irregular Utsuri (Midare-Utsuri) vividly. Tempering pattern (hamon) : Hamon is fine ko-nie base, Clove outline (Choji-ha), small Gunome zigzag. Ashi feet is shining toward cutting edge and Sunagashi blushing streams across the Ashi feet. YOU dots float in the interior of temper. 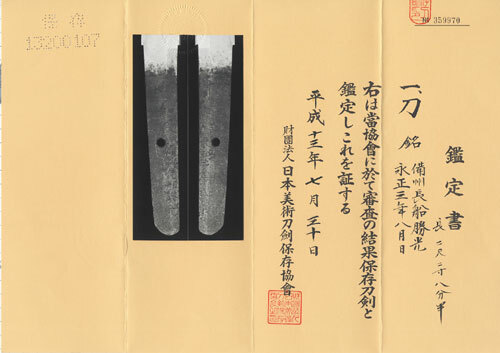 This work has a superb ji-ha and is a fine example of the famed swordsmith KATUSMITSU. Temper of tip (boshi) : Boshi is Midarekomi irregular,flaming up then small circle turns back. Tang (Nakago) : Nakago is UBU original. Katte-sagari (slightly slanting left) filemarks. Kurijiri round heel shape. One Mekugi-ana peg hole. 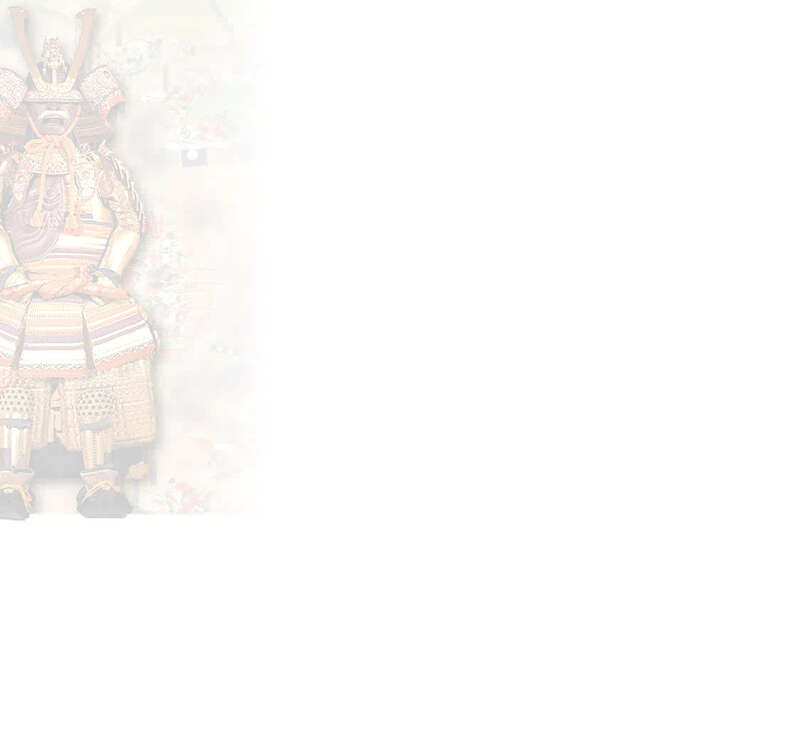 The signature in OMOTE side is chiselled with six character [BI SHU OSA FUNE KATSU MITSU] and URA side is the date of year [In the 8th month, the 3rd year of Eisho] (1506). On after the ōnin war (1466-1477), so called the Warning States Period, sword smith Ukyou-no-suke KATSUMITSU appeared. His existing works with the date of year shows his major active period from the 10th year to 16th year of Bunmei (1478-1484) and also there is a collaboration with his younger brother Sakyo-no-shin MUNEMITSU in the date of the 2nd year of Entoku (1490). An important cultural property, belonging to Nikkō Tōshō-gū shrine [Wakizashi signed Bizen kokuju Osafune KATSUMITSU-MUNEMITSU Bichu oite Kusakabe saku, Auspicious day in the 2nd month 19th year of Bunmei (1487)] with an original Chisa-katana Koshirae which was transmission by Tokugawa Ieyasu is their representative collaboration work. Jiro-saemon-no-jo KATSUMITSU who is a son of Ukyou-no-suke KATSUMITSU, his monumental work is the Juyo-Bijutsu-hin (Cultural Properties of Japan), personal belonging [Katana signed Bizen kokuju Osafune Jirou Saemon-no-jo KATSUMITSU Asa-Arashi (morning strom), Matsudaira Masatoshi shoji, Auspicious day in the 8th month, the 1st year of Eisho (1504)]. 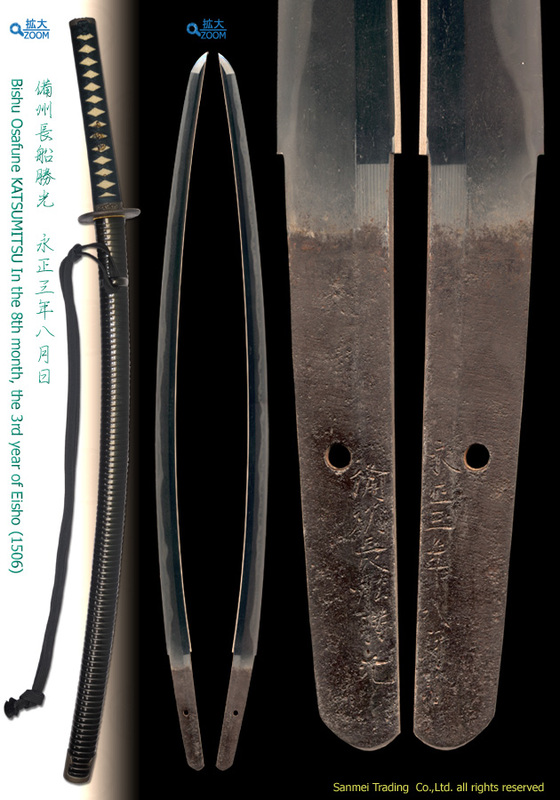 From Bunmei to Eisho (1469 - 1520) about 50 years, early stage of the Warning States Period, average size of cutting edge was about 2-shaku (about 60cm) which was designed for one-hand grip purpose and the subject katana, although size is longer than standard, was designed with short tang for one-hand grip. The shape is graceful with deep curvature, standing firmly on base and exquisite Jigane uses fine steel by elaborate forging. Splendid clove (Choji-ha) temper adds artistic value. The entire blade remains an UBU (original shape) condition with the one peg hole which has been treasured by generations. There is a darkish forging loosen ware in front under the Yokote ridge, which is elaborately eliminated and restored by a skilled polisher. Condition is in "good-very good" (Using a scale of mint-excellent-very good-good-fair-poor). 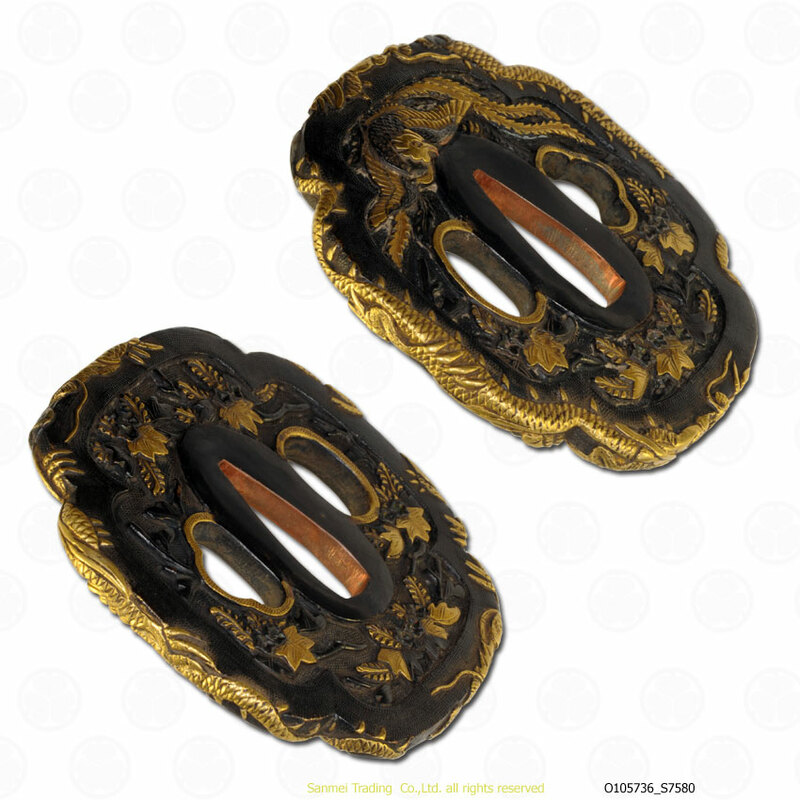 Fuchi/Kashira : signed MITSUMASA Nanako-ji surface Shakudo copper alloy ground Takabori Gold Iroe inlay. A throng of Horses motif. Tsuba : Matsukawahishi(a water chestnut) with cherry blossoms against bark motif（松皮菱に桜花図）. 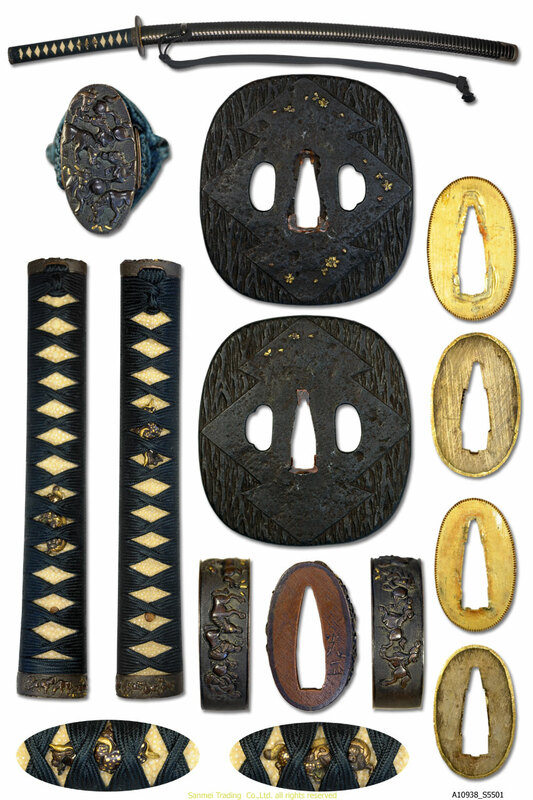 Round rectangular shape, Iron ground, Sukibori carve, gold inlay. Hilt : White rayskin, gray indigo-blue lozenge cord wrap. Scabbard : Notches black RO-IRO style Japanese lacquered with brass ground stone surface Kojiri end. Gold foiled bare rock copper ground habaki collar, preserved in a Shira Saya plian wood mounting.